During our recent Night Photo Walk the evening was warm and as the light faded the sky became very clear. 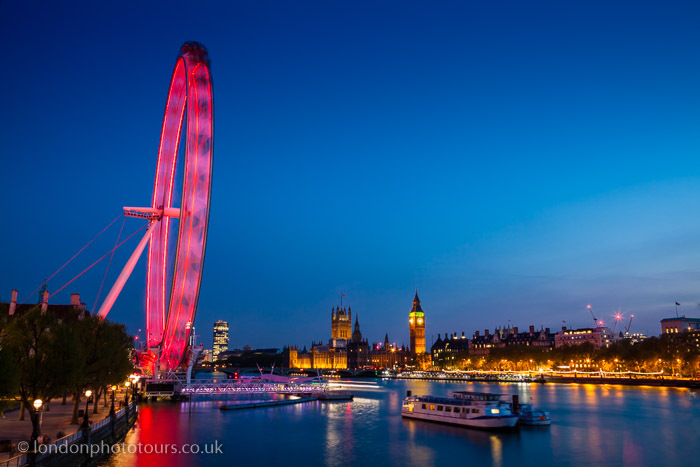 At twilight we made our way onto Jubilee Bridge to photograph the London Eye and Big Ben from across the River Thames. The view was perfect! We frame our shots and love the luminosity of the blue sky as the sun set. We captured the photo of the London Eye using a 30 second exposure. This gives the water a smooth glass like quality which reflects light and colour. A sense of movement is created too, as the London Eye appears to be spinning. Rich red tones melt into each other as creative blurring is achieved. For the best results we recommend that you use a tripod when taking part in a night photo walk. Night photography is one of the most challenging photographic genres there is. If you find it difficult to photograph at night we show you how to get it right. Most of all during our night photography tour, you learn how to take great night shots and exceed your expectations through understanding the dynamics of exposure. Lou is on hand at all times guiding you through the challenges of night photography. Join us next time and capture night photos with control and creativity. Learn the Art of Night Photography with Lou. See you soon!